A new book uncovers the history and social life of Russia’s flagship department store, GUM. Art and architecture critic Grigory Revzin and his co-authors have compiled an encyclopedia of Russian life as seen from the windows of the famous shopping arcade on Red Square. Here, through the lens of the encyclopedia, RBK looks at different perspectives of the department store itself, and the events of 20th century Russian history the building has borne witness to. 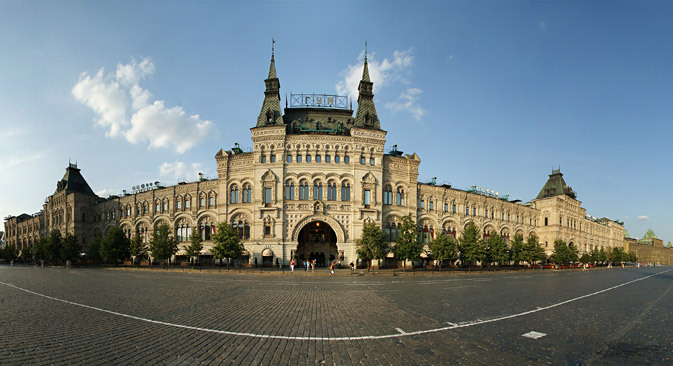 In almost 100 years of business, the iconic GUM department store on Moscow’s Red Square has seen it all, from brisk trade to hard times, from funerals to victory parades to fashion shows. Over time the shopping arcade has served as a residential building and has survived several threats of demolition. GUM was a mirror that reflected the life of the country – both the real and the longed-for. The store’s history has now been documented in the two-volume Encyclopedia of GUM, recently published in Moscow. Art and architecture critic Grigory Revzin and his co-authors compiled an encyclopedia of Russian life as seen from the windows of the country's flagship store. We chose four aspects of the store’s history from the encyclopedia that offer different perspectives both of the department store itself and the events of Russian history of the 20th century that are associated with it. GUM – the State Universal Store (with the emphasis on “state”) – first opened its doors on the initiative of Lenin in 1921. In 1923, the renowned Constructivist artist Alexander Rodchenko designed the GUM logo, which has been used ever since, and launched a series of posters with the poet Vladimir Mayakovsky. GUM was supposed to show abundance and plenty. However, the building was also residential in those days, and people lived there on the third floor. Muscovite Eleonora Garkunova lived in GUM for the first 25 years of her life, in a room with windows facing onto Ilyinka Street. “In this sense, we were fortunate – except for us, only one family had windows overlooking the street; all the rest had rooms with windows overlooking the inside, under the glass roof,” she said. Ten families were registered as living on Red Square, each living in identical conditions. There was no plumbing, and no gas, so people cooked on kerosene stoves right in the rooms. Residents had to use GUM's dirty public bathrooms for washing and their water supply. “At the end of the 1930s, a paybathroom opened in the basement at the entrance to Ilyinka – it was clean, and there were even electric hand dryers, just a miracle. The entrance was 10 kopeks, but I was happy to have that possibility. When the woman attendant learned that I lived in GUM, she let me enter free,” said Garkunova. This was despite the fact that her father worked at the People's Commissariat for Finance. At 8 a.m., when the stores opened, the entire of GUM would hear the sound of running feet – people who had been on duty since the night hurrying to join the queues in the different departments. Those who lived in the building learned to tell the time by this noise. The children of GUM residents were sometimes allowed to watch movies in the meeting room, the future Demonstration Hall, and they would go for walks in the Alexandrovsky Garden, alongside the Kremlin walls on the other side of Red Square. Only during the parades, several times a year, was it forbidden to bring in visitors, and a sentry was stationed in the room – to see to it that none of the adults came close to the windows. State television and radio presenter Igor Kirillov recalls it, too. He covered the parades on Red Square from GUM, watching the armored vehicles roll past on the small screen. He badlywanted to look out of the window and see the parade, but if he took a step toward the window, he would be literally pushed away by the guard. Eleonora Garkunova lived in GUM until 1953. After Stalin's death, GUM stopped trading for a whileand the residents were resettled. On the night of Nov. 8, 1932, Nadezhda Alliluyeva, Stalin's second wife and the mother of two of his children, shot herself in a government apartment in the Kremlin. She was 31. She shot himself in the heart, twice – the first shot was not fatal. The coffin containing Alliluyeva’s body was placed for a farewell ceremony in GUM’s Demonstration Hall, which now holds fashion shows and presentations. On Nov. 10, the hall was opened to all who wished to say goodbye – and a steady stream of people poured into GUM. There are newsreels of this civil ceremony, and it is clear that people were largely motivated by curiosity. It was an opportunity to see the top leadership of the country at close quarters. Lenin’s wife Nadezhda Krupskaya sat by the coffin, covered in flowers and wreaths. Stalin’s close political associates Vyacheslav Molotov, Grigol Ordzhonikidze, Lazar Kaganovich and Kliment Voroshilov stood around. “And here is Stalin himself with his face swollen from crying, gazing piercingly at the dead face of his wife. Where else could you see this?” writes Grigory Revzin in Encyclopedia of GUM. This was almost the only time in his lifetime when Stalin was seen simply as a man experiencing personal grief. It is hardly surprising that Stalin was ready to demolish GUM and erase the memory of that terrible November. He signed the relevant decree in 1934. By the early 1930s, trade in GUM had been almost abolished, and the store now resembled a huge office building for all kinds of institutions – from the Soviet Ministry of Culture to the Ministry of Coal Industry to the Union of the Red Cross. The site of GUM was designated the future location of the ministry of ministries – the House of the People's Commissariat for Heavy Industry. The giant building was designed in the form of an Italian palazzo, yet on a massive Soviet scale. The four 160-meter towers were to be linked by passages at a height of 30 stories, for the ministers to go to each other’s meetings. In the plans, the architects proposed to demolish the GUM building totally and convert Red Square into a huge avenue. On Moscow's 1935 Master Plan, there was no GUM: It was supposed to have been destroyed. “Moscow does not need GUM. Red Square, on which stands the mausoleum of Lenin, is too narrow. It should be expanded at the expense of GUM,” said the article that preceded the Master Plan. What is surprising is not that Stalin wanted to bulldoze GUM, but that GUM was not demolished eventually – it was earmarked for destruction on no fewer than three occasions between the 1930s and the 1970s. The first time it was Lavrenty Beria, head of the NKVD (Soviet security police) that saved it from immediate demolition – Beria’s office was located in the building and he refused to approveits demolition. In 1947, GUM escaped once again after plans were announced to use the site to erect a monument to the victory in WWII, a bizarre giant rotunda with surrounding stands. Historians believe GUM was just lucky; Stalin had not yet had time to think about what the square dedicated to his victory should look like. On this occasion, the venerable old store was saved by a fur coat, which was being sewn in the GUM atelier for “Grand Duchess of the Soviet Union” Galina Brezhneva, daughter of Soviet leader Leonid Brezhnev. When she arrived for a fitting, the masters complained that they were parting with customers for good – the atelier was closing. What the enraged Brezhneva told her father remains a mystery, but GUM survived. In 1953, after the death of Stalin, Trade Minister Anastas Mikoyan opened GUM following a complete renovation as a fundamentally new store. The new GUM became a symbol of the Khrushchev Thaw, the presentation of a new course – from war to abundance. An article about the opening of GUM even appeared in Time magazine,with a portrait of Khrushchev on the cover. “Every morning would begin with the announcement: "Workers of the store! In 5 minutes, our store opens. Take your working place and get ready for exemplary customer service,” writes GrigoryRevzin in Encyclopedia of GUM. It was Mikoyan who introduced the standard of the American department store with no shop assistant to Soviet trade. The country's main department store was seen as a platform for technical research. But Mikoyan's favorite brainchild was GUM's fashion department. It had unusual tasks for the Soviet trade – to design clothes and to promote fashion. The shows were always packed. In 1959, the fashion department reported that 500,000 and 600,000 people saw the GUM collection during its tours in the Soviet Union and abroad, respectively – at that time even the House of Dior could not boast of such figures. But the numbers are not all. In June 1959, public shows bythe French haute couture house took GUM by storm. A photo session of Dior models for Life magazine was held in the arcades of the store. The store became the place where Soviet women could hope to be a little bit like foreign beauties. It is here that the legendary 200th section, with special services for the party elite, emerged. It was the place where in the era of shortages you could buy a Chanel suit – an almost unattainable dream for actresses, ballerinas, diplomats and television presenters. This section was a state secret. A special police post was stationed at the entrance from Red Square. Politburo members and their wives were admitted without passes. The rest of the entourage could get in with a single-entry pass based on an application from the Central Committee. For example, Yuri Gagarin received a one-time pass to the 200th section after his flight into space.